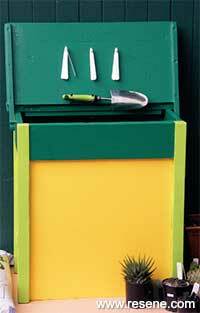 Mark Rayner recycles an old school desk as a storage box for potting mix and gear. You will need: An old wooden school desk, 9mm treated plywood, pencil, tape measure, cup hooks, tool clips, 25mm galvanised nails, screwdriver, hammer, saw, sandpaper, paintbrush and exterior PVA glue. Resene Quick Dry and Resene Lumbersider tinted to Resene Grass Stain, Resene Spotlight and Resene Limerick. 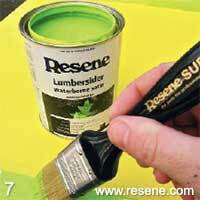 Top tip: If the desk has been varnished or painted with an oil-based paint, prime it with Resene Waterborne Smooth Surface Sealer. 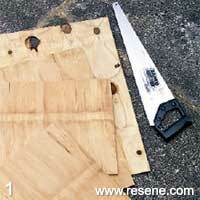 For the bin sides, measure, mark and cut four pieces of plywood to fit around the desk. Sand rough edges smooth. 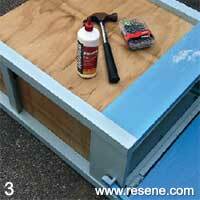 Carefully knock out the base of the old school desk, as shown. 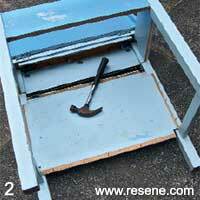 Attach the pieces of plywood to the insides of the legs of the desk, as shown, fixing with PVA glue and nails. Allow the glue to dry. 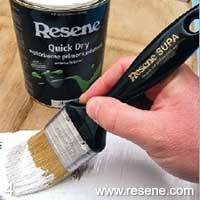 Lightly sand and remove loose or flaking paint from the desk and apply one coat of Resene Quick Dry to the entire unit. Allow two hours for it to dry. 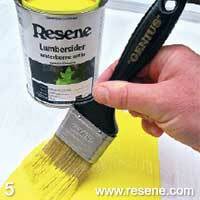 Apply two coats of Rewsene Spotlight to the front, sides and back of the unit, allowing two hours for each coat to dry. 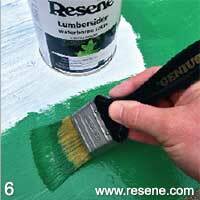 Apply two coats of Resene Grass Stain to the top, undersides and inside of the unit, allowing two hours for each coat to dry. 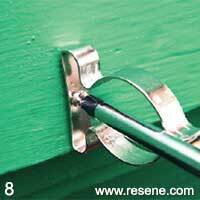 Apply two coats of Resene Limerick to the legs of the unit, allowing two hours for each coat to dry. Fix cup hooks and tool clips to the underside of the desk lid, making sure the lid closes cleanly when tools are clipped in place.